The beauty of social media is in its variety of channels, with each one lending itself to different storytelling strengths. Twitter is effective for open, ongoing dialogues with supporters, while Instagram gives supporters a visual, intimate peek into life at your organization. For nonprofits, perhaps the most underutilized and least understood of all channels is LinkedIn. But it is currently 414 million users strong, which means that telling the “professional” side of your organization’s story is definitely worth your time. It’s time to build and strengthen your professional connections. Make sure your organization is taking full advantage of the “world’s largest professional network” with these seven ways to use LinkedIn for nonprofits. Apart from your website, LinkedIn is the first pit stop for someone wanting logistical information about your nonprofit. The last thing you want is someone Googling your nonprofit’s name and “LinkedIn,” just to find a lackluster page (or no page at all). To create a LinkedIn Company Page, move your cursor over “Interests” at the top of your homepage, select “Companies,” and click the yellow “Create” button. Make sure you meet LI’s requirements for adding a company page. Use this page to establish your brand professionally by providing your address, boilerplate information, links to your website and career opportunity page, and links to other social media channels. Upload your nonprofit’s logo as the profile photo (200 x 200 pixels) and use a relevant cover photo for the banner image (1400 x 425 pixels). Pro Tip: Ready to dive deeper than the basics? Check out LinkedIn’s “Company Pages” resource which provides tips, insights, videos, and case studies for getting the most out of your business page. When people search your nonprofit’s name in the LinkedIn search bar, they’ll see both your company page and those of staff members who have listed you as their employer. You’ll want to make sure that all staff profiles are up-to-date. Consider creating organizational guidelines that outline descriptive copy that each staffer can use in their profiles. Use tools like Google Docs to make these guidelines “living documents” that can be updated over time. Pro Tip: If you have a stellar design team, create background photos for both your company page and the pages of your staff. This keeps everyone’s profiles branded consistently to your organization. While you should post organic status updates to your LinkedIn profile consistently to show off your content and keep readers in the know, you should also consider setting aside a budget for LinkedIn’s “Sponsored Updates.” Organic posts will only reach those who follow your company page, but sponsored updates allow you to push your content to new audiences and gain new followers. Need more registrants for your 5K event or attendees for your gala? Run sponsored updates delivered to professionals with those specific interests. 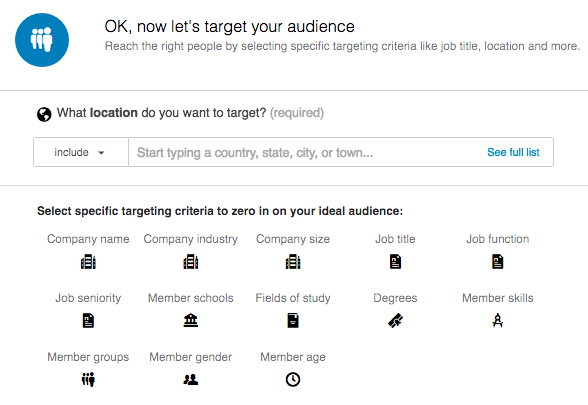 LinkedIn’s targeting is robust and allows you to select audiences by member skills, job title, company industry, fields of study, and more. Pro Tip: As you add layers of targeting to your sponsored update, your potential audience pool decreases. According to Classy’s own LinkedIn account manager, a rule of thumb for best paid results is to make sure your audience includes at least 100,000 members. Touted by LinkedIn as “your daily news, powered by your professional world,” Pulse is a newsfeed to publish and consume long-form content. Anyone can publish a post on any topic of choice, so use this as another platform to post job listings, volunteer opportunities, company announcements, or repurposed blog content. Keep in mind that company pages themselves cannot post to Pulse, only individual accounts can do so. 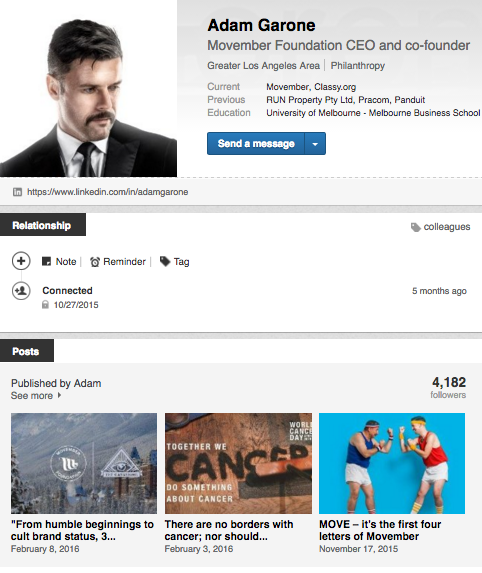 Adam Garone of Movember Foundation does an excellent job of consistently posting articles to Pulse, which allows him to both increase awareness of his organization and establish himself as a thought leader among his LinkedIn network. As a bonus, your published Pulse posts appear near the top of your personal profile, showing off your writing skillset and adding another level of diversity to your page. Pro Tip: All of your connections receive a notification when you publish to Pulse, directly connecting your network to your content. According to LinkedIn, groups were created to “provide a place for professionals in the same industry or with similar interests to share content, find answers, post and view jobs, make business contacts, and establish themselves as industry experts.” Groups function as discussion boards that provide a space for dialogue with thousands of other nonprofit professionals. Group topics can get pretty specific, from development and fundraising ideas, to nonprofit leadership, to social media for nonprofits. Solicit feedback on your nonprofit’s next event theme, or put in your two cents on an existing conversation. Feel free to post frequently in groups, but use them first and foremost as a listening tool to learn what your peers are asking and discussing. Pro Tip: Feeling really passionate about a niche topic that hasn’t been taken yet? Create your own group! By LinkedIn’s definition, a connection is a “two-way relationship” where you are both “following” each other, which means you see the content they post from your personal home newsfeed. However, you can follow someone without being a connection. 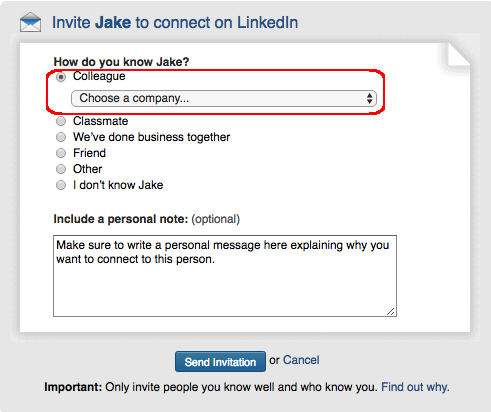 When you’re looking to connect with someone, LinkedIn prompts you to identify how you know the person so that the connection is legitimate. If this is a person you know through your nonprofit, then choose the “Colleague” button and select your organization’s name from the drop down menu. Keep in mind that connections are only possible with personal LinkedIn profiles, not company pages. Though company pages cannot follow or connect with any other profiles, they can be followed by personal pages. This is a meaningful metric to track in order to see your audience’s growth over time. Pro Tip: Follow “INfluencers,” LinkedIn’s designated list of 500 professionals who are invited to publish content as leaders in their respective industries. This includes Bill Gates, Ariana Huffington, and CEO of Classy client Team Rubicon, Jake Wood. LinkedIn is by far the best platform for professional networking, which looks like prospecting new board members, staff, or supporters for your cause. Make sure to post about all of these opportunities as organic status updates from your company page for all of your followers to see. If you want to reach bigger pools of qualified candidates for staff openings, you can purchase a 30-day job posting. LinkedIn also offers the “LinkedIn Volunteer Marketplace” which connects nonprofits to volunteers, and their “Board Member Connect” helps nonprofits vet “high-quality professionals” for their advisory boards. Pro Tip: For LinkedIn’s own unique take on corporate social responsibility, check out LinkedIn For Good, a community catered specifically to help people utilize LinkedIn for nonprofits. It boasts a wealth of curated resources, with both free and paid services available. Your nonprofit is your brand, your story, your passion project. But it’s also equally, if not more importantly, a business. Too often, nonprofits present themselves to their audience with only a passionate backstory or compelling impact photos. While this type of storytelling is essential, it doesn’t encompass the full narrative of your organization. People want and need more. This is why your external story to the public also must present your legitimacy as a well-run professional venture, which can compel people to invest their time and money in your cause. While we wish everyday was full of nonprofit networking opportunities like The Collaborative conference, LinkedIn can and should be used as your daily dose of professionalism and peer interaction. Now get out there and tell your story with a fresh, “profesh” spin.